Homepage Mobile Phones Motorola Samsung challenge the Apple iPhone with F490: Who will win? 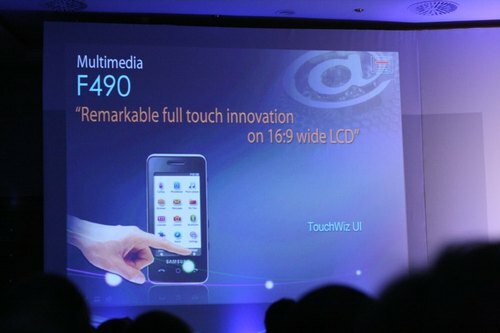 Samsung challenge the Apple iPhone with F490: Who will win? It seems Samsung are challenging the Apple iPhone with the all new Samsung F490, we already gave you the full specs of the F490 which you can see here, but as a recap the F490 will feature many specs that should put a smile on your face. For starters the Sammy phone will have a 5 megapixel camera whereas the iPhone only has 2MP, the F490 will also boast a 3.2-inch 16:9 ratio touchscreen display plus HSDPA connectivity as well. Samsung have also launched more phones called the Samsung F480, Samsung G400 and the Samsung B&O F400 which you can read about here. When we get our hands on the F490 we will give you the low down.